Novelist William Demby, born on Christmas Day 1922 in Pittsburgh, PA, grew up in Clarksburg, WV. He attended West Virginia State College for a time, with World War II interrupting his education. Demby entered the horse cavalry of the U.S. Army, served in both Italy and North Africa and wrote for Stars and Stripes. Demby followed with The Catacombs (1965), Love Story Black (1978) and Blueboy (1979). His work has been recognized for its distinct use of language and form, described as a unique pairing of traditional themes and modernist style. “Writing these novels was as often as not a sobering learning experience. 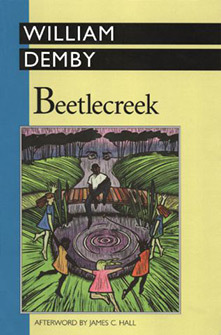 Beetlecreek taught me that Truth is seldom a blazing billboard of light, but as often as not the revelation of a gentle unfolding flower. “Writing The Catacombs was a monk’s daily intimidating lesson revealing yet another quirky turn in the mysteriously meandering path of history.